Laura, illustrated by her virtues and well-celebrated in my verse, appeared to me for the first time during my youth in 1327, on April 6, in the Church of Saint Claire in Avignon, in the first hour of the day; and in the same city, in the same month, on the same sixth day at the same first hour in the year of 1348, withdrew from life, while I was at Verona, unconscious of my loss.... Her chaste and lovely body was interred on the evening of the same day in the church of the Minorites: her soul, as I believe, returned to heaven, whence it came. Laura was the love of Petrarch's life. For her he perfected the sonnet and wrote the Canzoniere. Who Laura was and even if she really existed is a bit of a mystery. It has often been believed that the name "Laura" was a play on the name "laurel" the leaves which Petrarch was honoured with for being the poet laureate. However, there is a lot of evidence to show that Laura really did exist and that she was Laure de Noves. Born 6 years after Petrarch in 1310 in Avignon she was the daughter of Audibert de Noves (a Knight) and wife to Hugues II de Sade (and possibly the ancestor of the infamous Marquis de Sade). 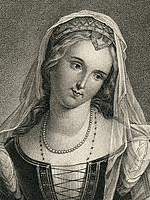 She married at the age of 15 (January 16th, 1325) and Petrarch saw her for the first time two years later on April 6th (Good Friday) in 1327 at Easter mass in the church of Sainte-Claire d'Avignon. Falling in love at first sight, Petrarch would be haunted by her beauty for the rest of his life. Already being married she would turn down all advanced he made toward her. She died at the age of 38 in the year 1348, on April 6th, Good Friday, exactly 21 years to the very hour that Petrarch first saw her (as Petrarch noted in his copy of a work by Virgil). There is no record to the cause of her death, but it was either due to the Black plague or possibly a pulmonary tuberculosis resulting from eleven childbirths. Several years after her death, Maurice Sceve, a humanist, visiting Avignon had her tomb opened and discovered inside a lead box. Inside was a medal representing a woman ripping at her heart, and under that, a sonnet by Petrarch. If she was real, it is unknown if they ever spoke, or if she ever knew of his feelings for her.